After lightning touched off the Coyote Fire July 16, the California Department of Forestry and Fire Protection (CDF) deployed more than 1,700 firefighters, 10 helicopters and several bulldozers to battle the blaze. 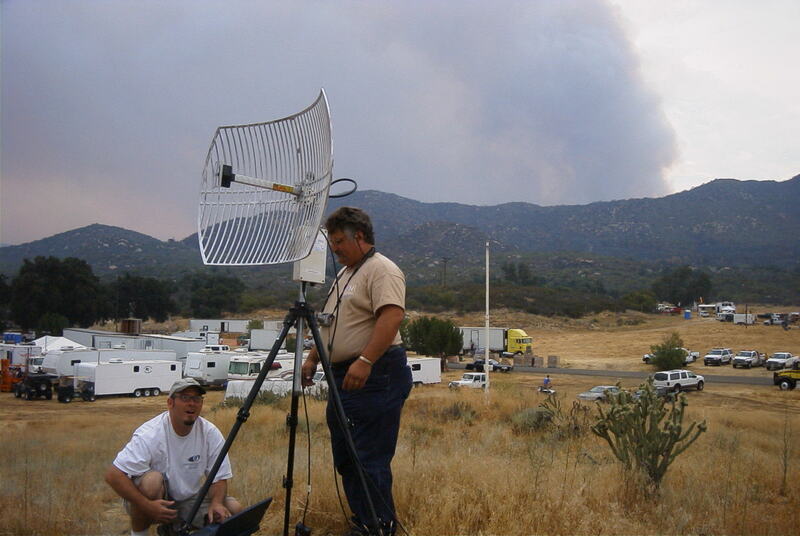 To provide Internet communications for the CDF operations camp, researchers from the University of California, San Diego (UCSD), and San Diego State University deployed a high-speed wireless link to the remote site in northeastern San Diego County within hours of a request for help. "The dissemination of information and incident intelligence up and down the command-and-control chain of command is more important than ever," said Jim Garrett, CDF Emergency Command Center chief. 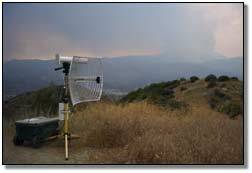 "The connectivity provided to CDF for the Coyote Fire was a real-life exercise that clearly demonstrated how valuable and useful the technology provided by HPWREN is to our agency. HPWREN provided us an invaluable service that cannot be overestimated." The 19,000-acre Coyote Fire was contained by July 24 and extinguished by July 27. 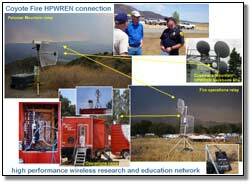 The High-Performance Wireless Research and Education Network (HPWREN) connection allowed the firefighters to receive weather and other data in real time and submit incident summaries to the state's emergency response agencies. HPWREN is funded by the National Science Foundation, the independent federal agency that supports fundamental research and education across all fields of science and engineering. "All in all, the initial antenna and data connectivity setup probably did not take much more than eight hours after the request was made," said UCSD's Hans-Werner Braun, an HPWREN principal investigator. "Then, the next day we added a real-time high-resolution network camera at the operations site to allow for remote image access to the local situation." The data connectivity team included Braun, Bud Hale, Jim Hale and Todd Hansen of the UCSD San Diego Supercomputer Center, as well as Pablo Bryant of the San Diego State University Field Station Programs. 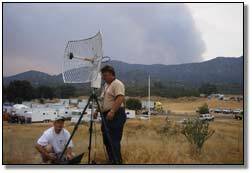 HPWREN reached the Coyote Fire camp via line-of-sight wireless links between the supercomputer center and the Cuyamaca Mountains, then to Palomar Mountain and finally to the CDF camp-a distance of more than 70 miles. The fire destroyed several buildings at the Sky Oaks ecological field station operated by San Diego State. Vegetation and instrumentation related to several ongoing experiments also burned. Plans are underway to link the Sky Oaks station to HPWREN, which already provides Internet connectivity to San Diego State's Santa Margarita Ecological Reserve. Earlier in July, the HPWREN team connected the CDF's Ramona Air Attack Base in San Diego County to its high-speed network. This connectivity allows firefighters to remotely access high-resolution still and video cameras, as well as other sensors located throughout the county. The link also provides access to Internet data such as satellite maps, infrared imagery, forest fuel conditions and weather at remote sensors in support of emergency situations. The CDF's Red Mountain fire station is also connected to HPWREN. The goal of the HPWREN project is to demonstrate and evaluate a non-commercial, prototype, high-performance, wide-area wireless network in San Diego and Riverside counties. The network includes backbone nodes on the UCSD and San Diego State campuses and a number of hard-to-reach areas in remote environments. 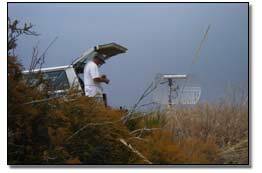 HPWREN is used for network analysis research and provides high-speed Internet access to field researchers in geophysics, astronomy and ecology as well as educational opportunities for rural Native American learning centers and schools. The HPWREN team also works with various state, regional and local agencies to demonstrate wireless networking in emergency response exercises. 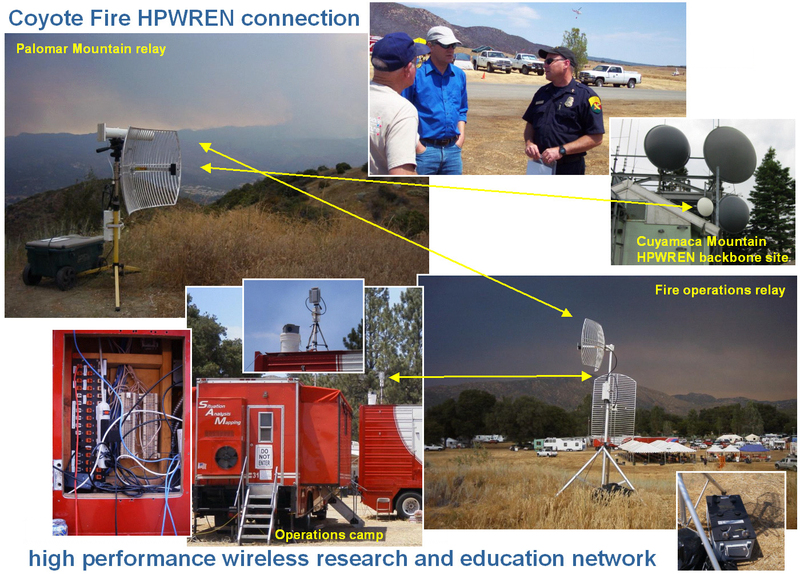 The HPWREN team established a wireless network link to the California Department of Forestry and Fire Protection's operations camp for fighting the Coyote wildfire in northeastern San Diego County. 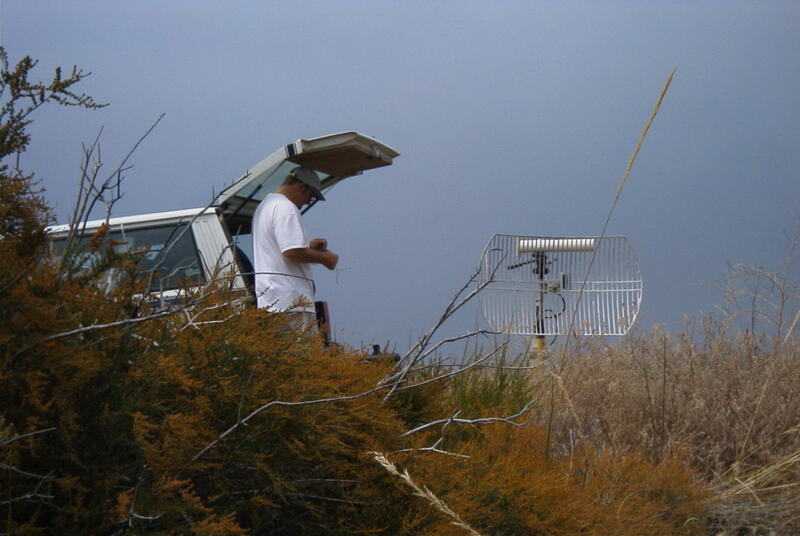 Along with HPWREN PI Hans-Werner Braun, SDSU's Pablo Bryant (shown here) deployed the Palomar Mountain relay for the HPWREN link to the CDF operations camp. 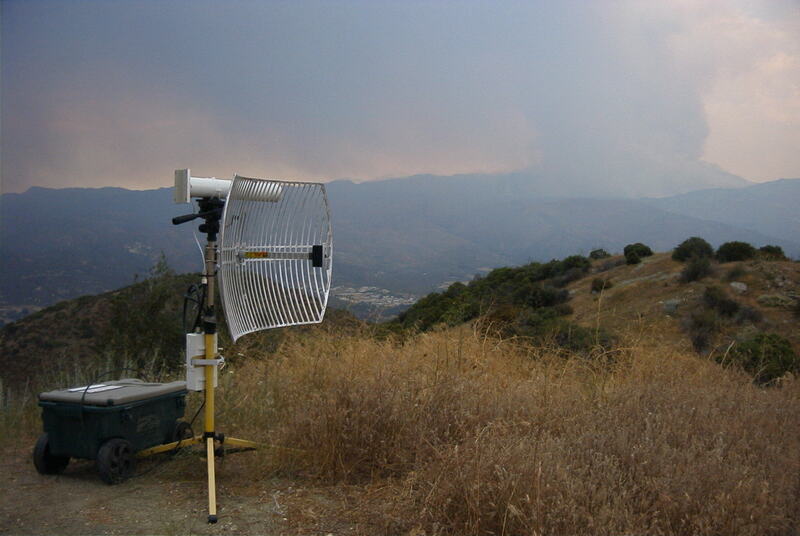 The HPWREN relay on Palomar Mountain, with smoke from the Coyote fire rising in the distance. SDSU's Pablo Bryant and UCSD's Jim Hale set up the final HPWREN relay at the CDF operations camp.